Here there be dragons—majestic, striking, and fearsome. 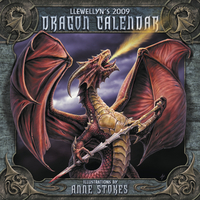 Internationally acclaimed illustrator Anne Stokes brings these mythological creatures to wondrous life in a new breathtaking wall calendar. Blending horror and fantasy, these images depict dragons in all their glory—as fierce warriors, noble protectors, and sacred beasts. Along with vivid illustrations, each month introduces classic quotes from Beowulf, Shakespeare, legends, and fairy tales.